Discussion in 'PvP TLE Discussion' started by Satyr, Apr 16, 2019 at 5:20 PM. Thread to compile all post-DoF issues. Half of the DoF items "require KoS" expansion. Even items that are definitely DoF and not KoS (or higher). Heroic mobs have far too much HP without blue stats atm. HP pools are a bit too deep but I don't think it's completely off to buff the given how fast contested would drop otherwise. - Both Gibe and Reinforcements do nothing in PvP. 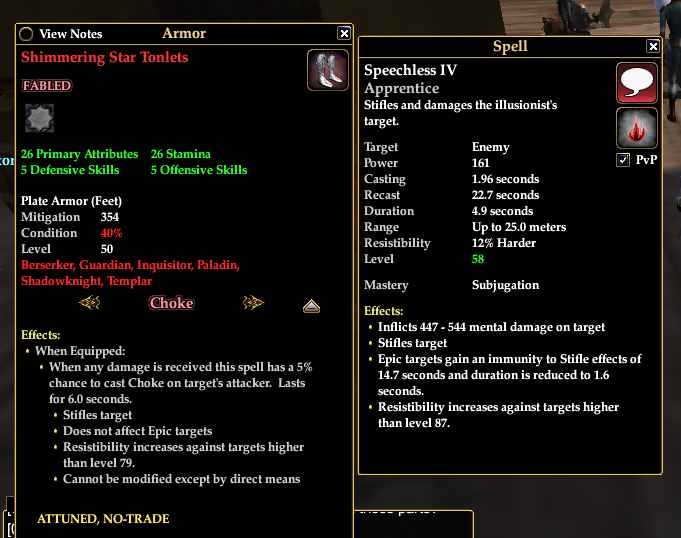 On original Nagafen and on deathtoll both of those spells were integral to Berserker's and Guardian's kits. I have not confirmed it but some players have reported that Paladin's Sigil does work in pvp. The crusader meta is already stale, please allow warriors to bring their own flair to group pvp. -feel free to readd threat in the pvp template for Innoruuk's Caress as well. What's the ETA on these Kingdom of Sky tags getting removed from gear? This kind of stuff needs to be hot fixed. If we have to wait 1/4 the duration of the entire expansion to be able to equip some of this gear it would be really annoying. Wasn't able to get direct feedback from a defiler, inquisitor or templar but I also know the durations and cast times for ancient terror and terror chant (defiler), awestruck and harmony (templar) and incarcerate, disorientation and tormenting conversion (inquisitor) are an issue. Ancient terror, tormenting conversion and terror chant would be fair at a duration of 4. 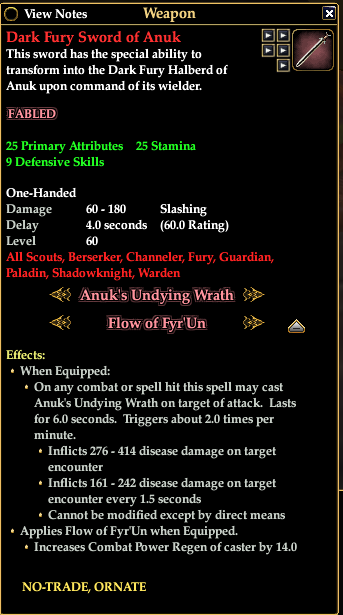 Awestruck should be at PVE cast time and have a duration of about 4. Incarcerate should be at about 6. Harmony should be aligned to the other emergencies (4 seconds). As mentioned above, both hilt strike and cheap shot should be increased in PVP too to allow for classes like assassins to execute positionals properly. Also would consider buffing paladin damage please. You've put their heals in the dirt, and now its next to impossible to survive long enough to kill anyone. Item balance way off. Lack of stats makes everything completely vanilla. Possible to add blue stats to fabled/legendary to differentiate from treasured? Healing is a bit overboard for summoners, dirges and druids - dirges and summoners heal like healers!. The poster to get bounties that the NPC gives you, it would be great if it was just like the old system and allow you to pick up the daily without having to run back to the npc, so you can get it anywhere without having to go back to town. Also being able to trade the tokens and get a crossbow in one day is kinda silly. I just had like eight people kill a target, had them trade me the tokens and I had the crossbow without ever really having to try to get it. The reward is also pretty busted, 10% Reuse on a server with zero other bluestats is absolutely insane. Regarding pvp rewards in general, it would be nice if the tokens either got a new reward, or you allowed us to purchase masters or other rewards with the tokens. Right now once players have the crossbow, which most do given people are just making 10-12 accounts and killing their main toons after the disco xp cheese fiasco. You guys nerfed player CC down to a point where it's almost useless, I find myself stunning someone for less than a random piece of proc gear which is extremely infuriating as I'm playing an illusionist. Don't get me wrong player CC is doing something, but when you can attack someone with every piece and then get feared for eight seconds, then stunned by another piece of gear right after; it's ruining the game. I already find proc gear to be silly as it doesn't create an even playing field in PVP combat. You will have a very hard time defeating a group with full proc gear versus a group without, when pvp should be enabling skill; not gear with insane procs. Example below. Basically impossible to pvp without one right now, the heal output they are doing isn't relative to how much damage we are doing. It's a serious hinder to really any group right now to bother bringing a cleric/shaman as a solo healer compared to a druid. I can spike down a cleric/shaman with ease compared to a druid. This argument is as old as pvp that druids are insane healers, but they are really insane right now. An entire group looking at ACT with one healer, and no tank was pushing 1200dps, and the druid was healing for 1k hps. If we had another healer and a tank it would be near impossible to burn a healer. Seems fine in DoF, but when you guys launched this expansion it now takes longer to kill things in the T5 content than it does to clear content in DoF which is confusing. I'd take a look at what happened, and adjust accordingly. In general it seems like things have a bit of HP on this server, seeing as how it's a month long, i'd like for raids to be a good 3 hours to clear everything once, that way if someone wants to double clear and raid the extra day they can. With that I would consider adding double loot for raids given the timeframe. The tank weapon is overtuned right now, it can hit all six targets in a group and stack like curse of darkness, which means it's going to do around 7k damage to a group if it lands on one target, per user of the sword; if a swash was to aoe and land the proc on every member of the group it would just multiply like curse, menaing 7k is now 7k x6, I haven't gotten the sword to test if it was broken on this server, but it was working that way on Fallen Gate. This means if I was to just stack a tank, bard, rogue, druid, and have four sword I could easily burn an entire group and have 40-50% of our groupwide damage coming from the sword alone. The sword was pushing 2-3k dps on Fallen Gate on encounter fights, pushing troubs into the warlock tier of encounter damage. Just proccing it on one person it would do 6,840 damage before resists to the group cumulatively. If it's anything like prismatic shard was before it was balanced; it's gonna be a problem. It would be nice if the drop rate on these things could be increased given how players are only using the spells that they currently possess for a month or two given the spell tier. I think I should be able to master out a toon with relative ease because I only have a month before 20 of my spells become outdated. I'm sure I missed a few things but this is the things that I find of most importance on the server currently. When is Caith getting fired? That dude’s fingers must be bigger than King Kong’s.